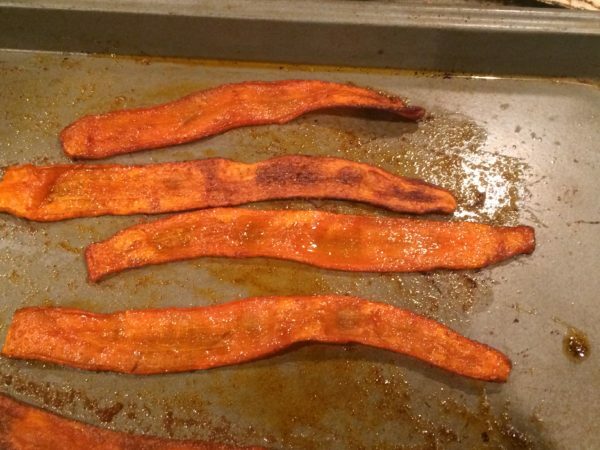 If someone ever offers me “vegan bacon”, I’ll try it, but probably dread the taste. But, this is something that intrigued me immediately. There’s no meat here: just carrots and seasoning. Obviously, this is fully vegan. If you close your eyes and take a bite, you’d swear…well, you’d know you weren’t eating real bacon, but I have to say it’s delicious. The only thing missing is the mouth feel: this doesn’t have a texture like bacon. 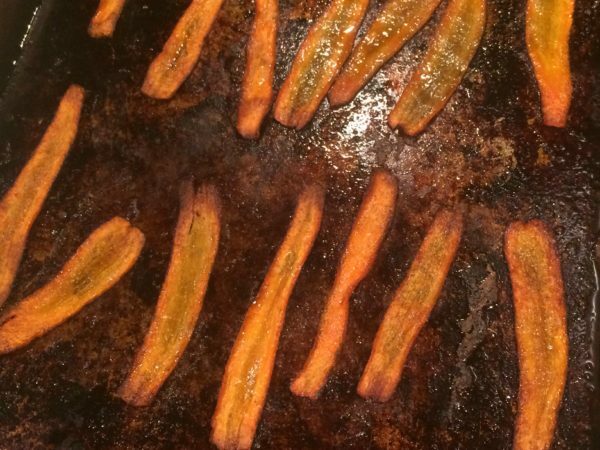 I think there’s a sweet spot between under-cooking, which comes across like a baked carrot, and overcooking, which is crunchy like a cracker. The dark patches you see were the latter: while tasty, it doesn’t conjure up bacon. On the other hand, it’s still tasty, and much lower in calories than the real thing. 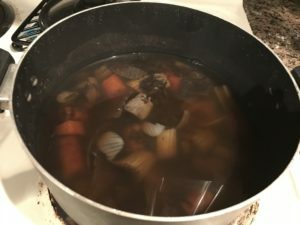 Recipes I’ve seen have the cook only last 15 minutes or so. This doesn’t yield the look or feel that I want, but maybe it’ll work for you. Preheat oven to 320° F (160° C). Wash carrot. 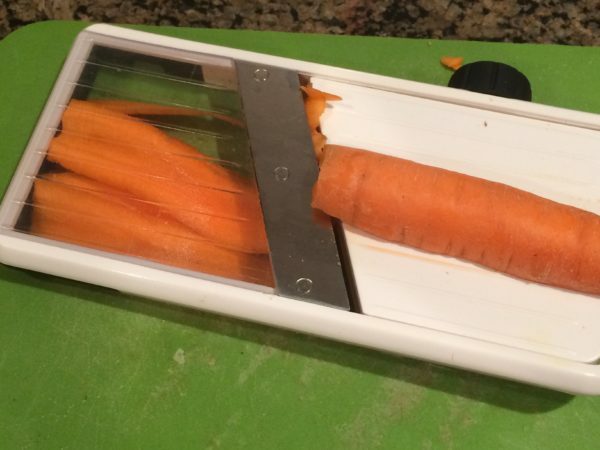 Using a mandoline set at 1.5 mm, cut the carrot into strips. 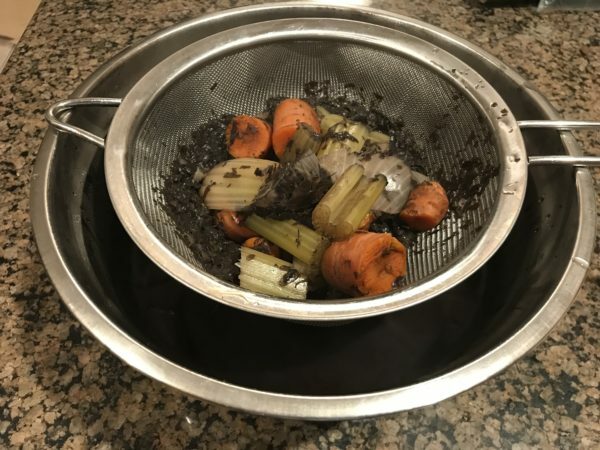 I used a cut-proof glove so I could get every bit out of the carrot. Combine garlic salt, paprika, and oil. 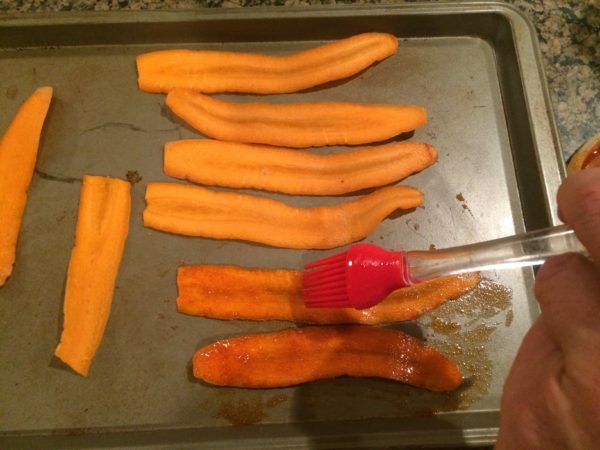 Brush on both sides of the carrot strips and place each on a baking sheet. Bake for 15 minutes. Flip over each piece (just like bacon in a pan!). Cook for 10-15 more minutes, or until pieces curl up like bacon.